Being a Compeer volunteer is as easy as being a friend! These are the types of activities that our Compeer clients like to do, too, only they often find it more difficult to make friends to enjoy life’s simple pleasures. Compeer volunteers are matched to our clients based on their common interests and hobbies – and then they spend time together, just as any friends would. Being a Compeer volunteer is rewarding and fits into your current lifestyle because you choose the hours just as you would with any friendship. Most Compeer friends get together once a week for an hour, choosing the time that best fits your schedule. Contact the Compeer office or download an application here (PDF). Email your completed application to director@compeer-lebanon.org . Attend a training session and discuss the benefits of friendship. Volunteers and friends are matched based on mutual preferences, same gender, similar age, location and shared interests. Compeer staff will introduce you to your Compeer friend. After that, you and your new friend can set up times to get together. Spend time with your Compeer friend. Arrange regular meetings, attend local events and activities. Get to know each other. Become friends! Compeer staff provide on-going professional guidance and support for you and your friend. Congrats to Dave Strasz for winning the Lebanon County Council of Human Service Agencies 2015 Volunteer of the Year Award! 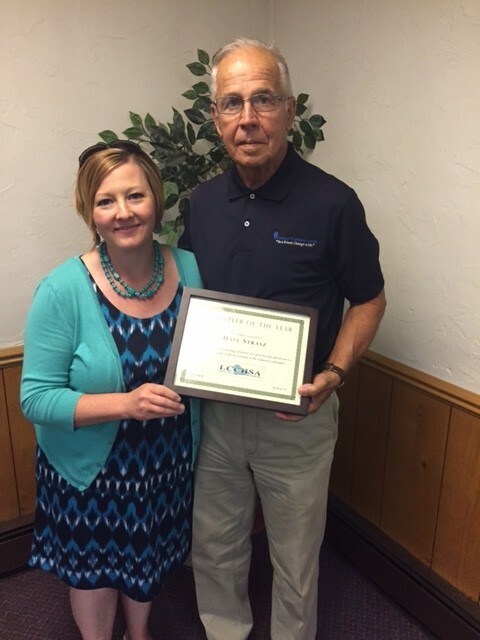 Dave was recognized for his dedication and commitment to Compeer as both a board member and volunteer. We are so fortunate that Dave is a part of our organization, but his Compeer friend is the one who benefits the most from Dave’s kindness and selflessness. Thank you Dave for advocating for individuals who are in mental health recovery in Lebanon County.